Austin’s population continues to grow, even exceeding the prognostications of experts, the Austin Business Journal reports. Last year the Austin metro welcomed an average of 159 new people to the city each day. That number was calculated by using U.S. Census data on migrations, births and deaths to determine that the area’s population increased by 58,301 in 2016 to about 2,056,405. New residents are drawn to the Austin area because of the large number of jobs being added, especially in the technology industry. The number of new people is also the reason why affordability is such a problem; homes just cannot be built fast enough to accommodate all the new citizens. 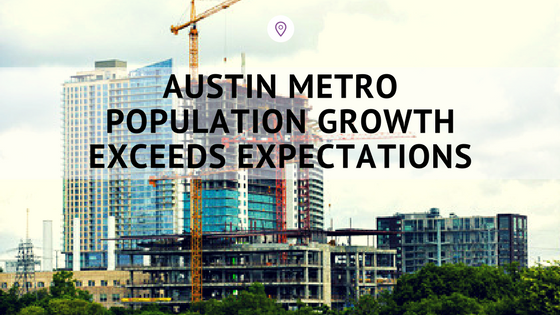 Austin grew the fastest of any metro of its size and the entire Austin area grew 2.9 percent, making it number nine of all U.S. metros. Austin demographer Ryan Robinson says that 2.9 percent growth is higher than what he’d projected. He predicts that the Austin metro will have 3 million residents by 2030. Robinson doesn’t expect Austin’s growth to slow down anytime soon. Hays County, Austin’s southern neighbor, came in at the number three spot on the list of the fastest growing counties. Hays added 9,896 new people, which gave it a 5.1 percent rate of growth and took the overall population to 204,470. Are you a new Austinite who needs to find a place to live? Well, Austin Apartment Specialists South Austin is happy to help! Just give us a call at 512-912-8000 to find your dream apartment today!